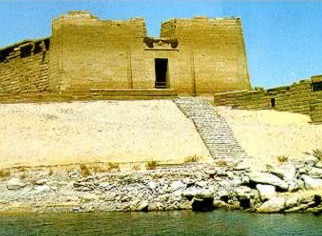 Kalabsha Temple originally built at Kalabsha (Talmis) was moved to its present location at New Kalabsha (Chellal) in 1970, together with other monuments from Nubia, including the Kiosk of Qertassi (Kertassi). Also nearby is Beit al-Wali. Reachable by taxi or by boat, depending on the water level, the sandstone edifice was built by the Roman Emperor Octavius Augustus (30 to 14 BC) and dedicated to the fertility and Nubian Solar deity known as Mandulis (Merwel who was the Nubian counterpart of Horus). It was the largest free-standing temple of Egyptian Nubia and the design of Kalabsha Temple is classical for the Ptolemaic period with pylons, courtyard, hypostyle hall and three room sanctuary. However, the Pylon is offset, which creates a trapezoid in the courtyard beyond. It was built on the site of an earlier structure built by Ptolemy IX as evidenced by a chapel. There is also a small chapel and gate on Elephantine Island from Kalabsha, and a gate built by Augustus was given to the Agyptisches Museum in West Berlin. The courtyard just inside the pylon once had columns on three sides. At either end is a staircase that leads to the upper stories of the pylon and a good view of Lake Nassar. On the right screened wall separating the courtyard from the hypostyle hall is an inscription from Aurelius Besarion (about 249 AD), the governor of Ombos and Elephantine, decreeing the expulsion of swine from the town for religious purposes. On a column here is the text of King Kharamadoye and is one of the longest Meroitic inscriptions found to date. On an end wall is thought to be an inscription of the 5th century Nubian King, Silko, who conquered the fierce Nubian Blemmyes. Other seances on the on the screen walls include the King with Horus and Thoth. On the rear of the vestibule are scenes depicting a Ptolemaic king making offerings to Isis and Mandulis. Also, Amenhotep II, who founded the original temple (1450 to 1425 BC) upon which this one is built, is making offers of wine to Min and Mandulis. After the vestibule are three chambers, the pronaos (a chamber preceding the sanctuary, the naos, or sanctuary where statues of gods were located, and the adyton, which is the innermost or secrete shrine). Various seances within these chambers show the King surrounded by the goddesses of Upper and Lower Egypt, Amun-Min and Ptah while receiving holy water from Thoth and Horus. In the naos and adyton, the king is making offerings to Osiris, Isis and Mandulis. There is also a small chapel which can be reached from stairs in the first chamber which then descend from the roof into the chapel set inside the wall. As you leave the temple, be sure to note the rear wall with images of Mandulis with his vulture feathered cloak.